In this article, we take a look at the different environmental impacts of solar energy. We’ll discuss the negative and positive impacts that solar power can have, at both a local and global scale. Let’s start with the negative impacts that solar energy can have on the environment. This impact applies mainly to solar farms. When construction workers build such installations, they often need to clear vast swathes of land. This process can have irreversible consequences for the local environment. It is known that land clearance can lead to soil erosion. This can reduce the level of nutrients in the soil, making it harder for plants to grow in the future. Land clearance can also destroy habitats, displacing animals – some of which may be endangered species. A large area of land that has been cleared to make way for a solar farm. Land clearance can also contribute to global warming. This occurs as a result of two aspects. Firstly, as construction workers clear vegetation, it is often either burnt or left to rot. Both these processes release greenhouse gases (such as carbon dioxide and methane) into the atmosphere. Secondly, you should note that vegetation helps to absorb carbon dioxide and release Oxygen back into the atmosphere. As we clear more land, we are reducing the capacity for this process to take place. Whilst this may be negligible on a local scale, land clearance becomes a major issue when we look at it from a global perspective. It’s important to note that most residential (and some commercial) solar energy systems are rooftop installations. Such installations make use of land that has already been cleared for construction purposes. Therefore, in this instance, the impact of land clearance does not apply. We often overlook the impact that solar energy can have on water consumption. Homeowners and solar power companies need to clean their solar panels at regular intervals. This helps to ensure peak efficiency and enhance return on investment. Dust and dirt gradually build up on top of solar cells, reducing the level of sunlight that can penetrate the surface. 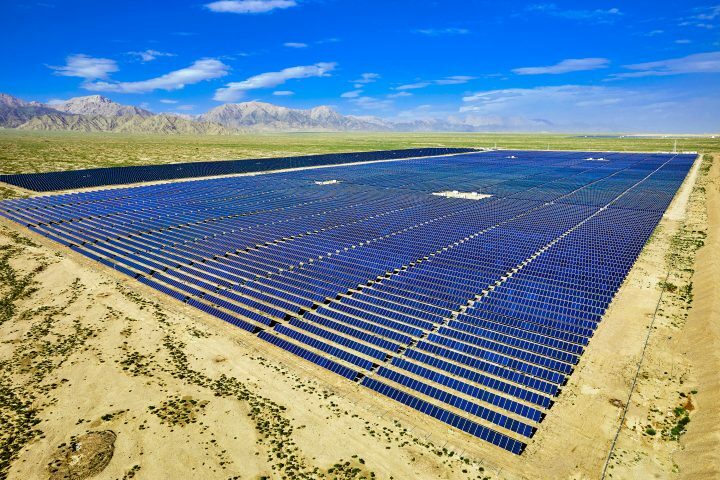 Most large-scale solar installations and nearly all solar farms will have an irrigation system for cleaning purposes. Solar farms that make use of a concentrated solar collector also require water for cooling purposes. The process of cleaning solar cells can consume significant volumes of water. The impact of this is a reduction in the availability of fresh water. This might not be an issue in some places, but in arid locations such as deserts, it can become a major problem. 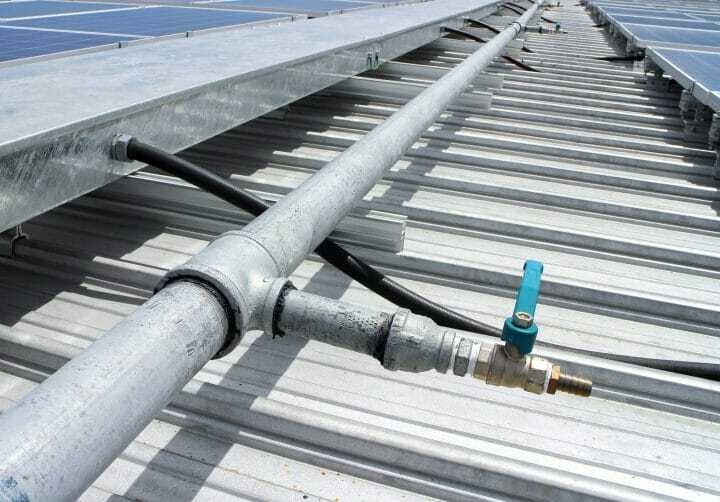 A water supply installed as part of a solar panel installation. Water consumption can have even more environmental impacts. For more information, why not reference this article from HuffPost on why wasting water is even worse for the environment than you might think. When we think of solar panels, we often think of them as been very good for the environment. Most people overlook the impact that the materials they are made from can have on the environment. Although materials do vary between different types and brands of solar panels, most contain toxic materials somewhere in their design. Materials including lead and cadmium are examples of such materials found in manufacturing processes. Whilst this isn’t an issue during the lifespan of a solar cell, problems arise when they reach the end of their life. When disposing of a solar cell, this should be done correctly in order to avoid toxic materials leaching out into the ground. Solar thermal systems have an additional toxic concern to think about. These systems often make use of a heat exchanger. This involves the use of a heat transfer fluid to carry heat from a solar collector to a storage tank. Whilst there are many non-toxic fluids available, some are made from toxic substances. Some also include compounds such as propylene glycol to act as an antifreeze. Whilst there are many negative environmental impacts to consider, most of these are negligible. We’ll now take a look at the positive environmental effects that solar can have. One of the key positive impacts that solar energy can have on the environment is the carbon reduction they offer. We often refer to this as carbon offset which refers to the process of compensating for carbon emissions made elsewhere. Using solar panels to generate electricity reduces the need to generate the same power requirements from traditional methods. Coal, oil and gas power stations all release significant levels of carbon emissions into the atmosphere. They do this during the combustion of fossil fuels – something that most renewable energy technologies do not involve. Making use of the sun as an energy source for electricity production helps to reduce our carbon footprint. With fewer carbon emissions, solar has a much lower effect on climate change than fossil fuel alternatives do. Traditional power plants require various fluids for cooling purposes. Depending on environmental restrictions, power companies sometimes release these fluids back into the environment. This can pollute the local water table and have far-reaching consequences when released directly into a river (or the sea). Most solar panels, on the other hand, do not require such fluids and are better for the environment. Whilst some solar thermal and concentrated solar collectors do use toxic fluids, the level is often far lower than that of a traditional power plant. As a result, these fluids are easier to dispose of in the proper manner. Nuclear power stations also produce significant quantities of contaminated water. This is mainly a byproduct of the storage of radioactive materials. Luckily, waste of this type often has strict control measures to help protect both the environment and people. Making use of the sun to generate our electricity helps to conserve the earth’s natural resources. Solar panels do not require any solid fuel to be able to generate electricity. They do not require the mining of materials such as coal, oil, or gas. This reduction in mining requirements has huge benefits for the environment. You should now have a better understanding of the environmental impacts of solar energy. Key negative impacts include land clearance which can destroy habitats and kill vegetation. You also have to consider water usage, which can be a significant impact in locations where water may be scarce. On the other hand, solar energy has many positive impacts. These include helping to reduce the levels of greenhouse gases we produce during energy production. This not only helps to reduce the impact of man-made climate change, but it can also help to improve the quality of the air we breathe. Whilst there are numerous impacts to consider, many people consider solar energy to be an environmentally friendly way of generating electricity. If you would like to learn more about the benefits of solar energy, we also have an article covering that topic here.